On Facebook this morning, a number of my cycling pals shared a link to a new billboard erected along I-85 by the Adam Little Foundation. From the Foundation's website, Adam was "a cyclist from Mt. Pleasant, NC who was struck and killed by a distracted motorist in March 2010 as he commuted to work." With all due respect to the deceased, and his family and friends, I think their billboard's message falls flat for a number of reasons. By saying "he's not just a cyclist slowing you down," (emphasis mine) the billboard is stating that he is a cyclist slowing you down. This billboard is telling motorists that cyclists are road users who are hindering traffic. This is a divisive message, likely based on the author's apparent cyclist inferiority complex. 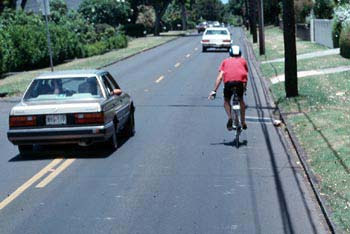 It separates "cyclists" from "traffic" based on speed, and positions cyclists as being a problem ("slowing you down"). This is absolutely the wrong message for an advocacy group to be sending. Cyclists are an established part of traffic that are to be respected as other components of traffic. While I expect that one goal of the sign is to honor the memory of Mr. Little and personify cyclists by showing his picture, I would suggest that a more effective image may be one of a motorist successfully passing a cyclist on the road. A clear and obvious illustration of the right way to interact with cycling traffic on the road. Perhaps something like this picture from Paul Dorn's "Bike Commute Tips Blog.". An image like this clearly shows expected traffic behavior in a form that can be readily understood in the extremely brief time that a motorist has to view the billboard. Lastly, I think in order for behavior modification messages like this to be effective, the target audience has to understand how they are part of the problem and have at least a passing interest in changing their behavior. An example is "stop smoking" messages. Smokers know they smoke and probably understand that smoking is dangerous. I think this sign, though, is like "Baby on Board" signs in that it's trying to get people who generally think they are behaving safely enough to behave more safely. My sense is that people viewing this billboard will understand the message, but feel that it doesn't pertain to them. I applaud the efforts of the family and friends of Adam Little to turn their tragic loss into action in support of the cycling community. But I fear their efforts, based on the cyclist inferiority theory, risk having an outcome that is 180 degrees off from their self-stated goal of "mak[ing] motorists aware that cyclists have the same rights as any motor vehicle on the road." I welcome the Adam Little Foundation to the NC bike advocacy community and encourage them to pursue relationships with existing cycling advocacy groups such as CABA or NCATA to pool efforts and leverage best practices. Update: Just noticed in a tweet that the Adam Little Foundation is indeed engaged with CABA at some level. Good on ya! Too bad "Baby On Board" doesn't seem to coincide with "I'm Not Going To Drive Like A Moron." If you have a baby on board, shouldn't you, perhaps, not be speeding, tailgating, failing to use signals, and running stop signs? The main issue I have with cycling advocacy in general is that most of the cyclists I see on the roads are not well-behaved. They don't ride single-file, they don't use hand signals, they don't have proper mirrors, they run stop signs and stop lights, they pass stopped lanes of traffic on the right... These are the same people that have kilobuck road bikes, dress in full skintight racing garb, etc. I have no problem being polite to cyclists, but I can't help thinking there's an end of the deal that many of them are not holding up. you have time check it out.